Everyone takes tons of photos at your wedding - and the truth is, it's difficult as hell to collect them all and save them for you to look at. And while there are a number of other options, this one seems like the best (well of course for those people with iPhones) by far. Wedding Party is the app for the wedding! Couples can customize the app to make it their own and their guests can download the app to contribute their memories of the big day. the Wedding Party iPhone App allows you to see your guests photos without really trying that hard. 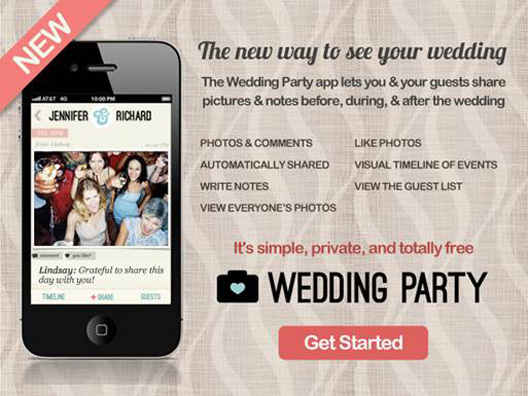 *Use Wedding Party to contribute to the couple’s big day! *Collect candid shots that your photographer will miss and experience your wedding through the eyes of your guests!